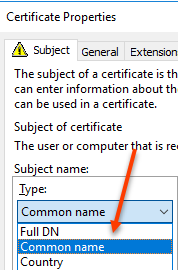 So, you have a PKI or access to certificates and want to encrypt SQL connections. Easy! NOTE: We are not discussing encrypting the database or anything like that. 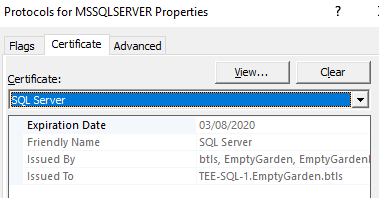 Just the connection from the application (in this case the application is SQL Server Management Studio (SSMS) to the SQL server. In my lab environment I have an Enterprise PKI consisting of an offline root and a subordinate issuing CA. In my lab my subordinate CA (or issuing CA) is on my DC. DON’T do that in production! First we need to open the Certificate Authority. This can be found in Administrative Tools. Provide a Template Display Name. You might also want to change the validity period and renewal period, but that is completely up to you and your organizational policies. 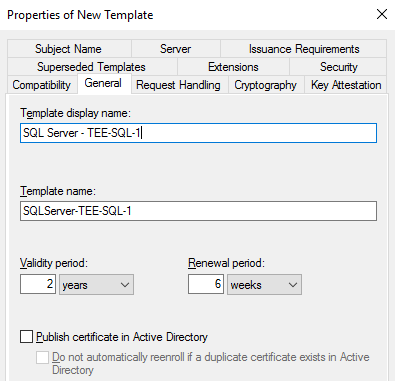 In this example I am naming my template SQL Server – TEE-SQL-1. 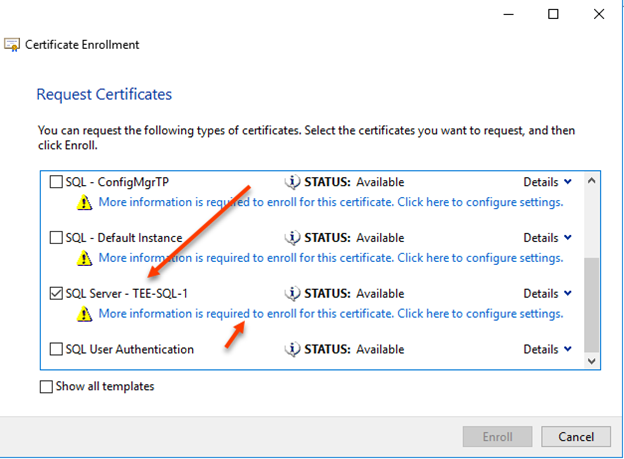 You will not want to use the same cert for all your SQL servers. 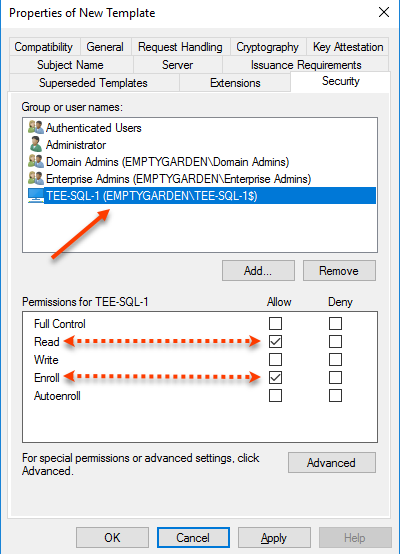 Thus, you can see I have a naming convention of “SQL Server – ” and then the SQL Server name, which in my case is TEE-SQL-1. The only other step is to go to the Security tab and remove Enroll rights from whatever groups you want. 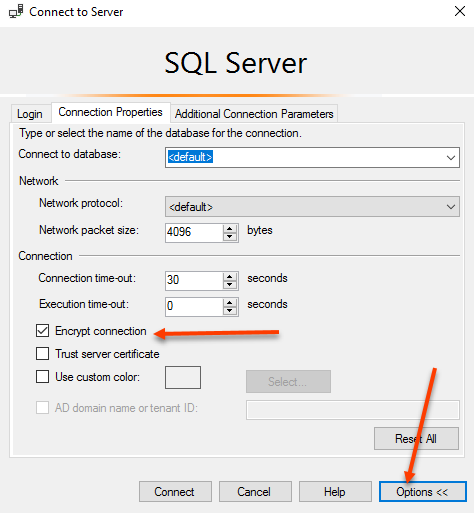 Then add the machine name of the SQL server and give it Read and Enroll rights. 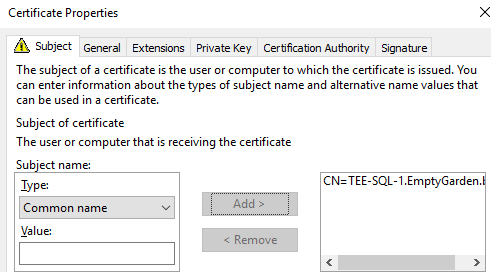 In the Certificate Authority, right click Certificate Templates and select New > Certificate Template to Issue. 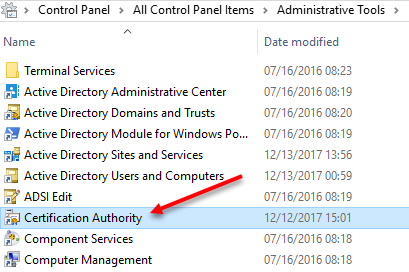 NOTE: You will need to wait for Active Directory to replicate the template in order to issue it. 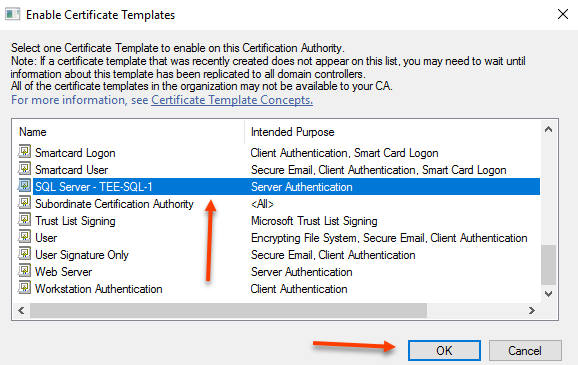 The SQL Server certificate has now been created and issued. 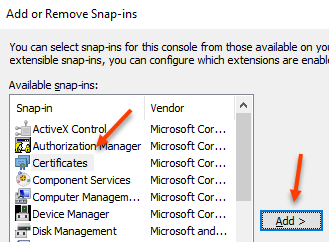 Select Next and select Active Directory Enrollment Policy. 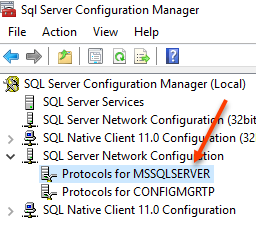 Enter both the FQDN and the Netbios name of the SQL Server. NOTE: If you have availability groups you will want to enter those names too. Select the General tab and enter a friendly name. NOTE: without a friendly name certificates can be hard to find! If you were to try and configure SQL Server to use the cert at this point, it wouldn’t show up. Unless you are running SQL as local system, in which case you can close this article. You have bigger things to worry about!! 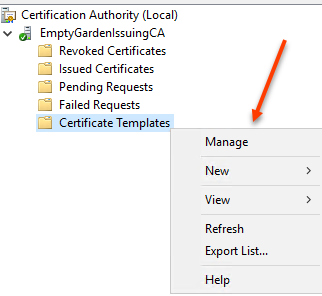 We need to give the SQL Server service account rights to read the certificate. 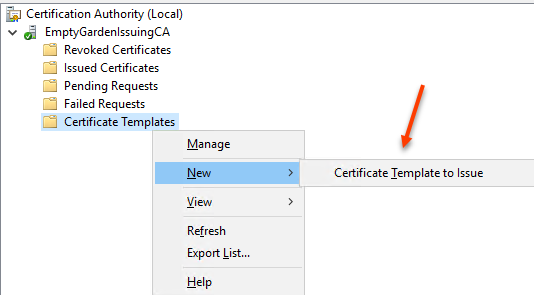 Return to the Certificates MMC and right click the certificate and select properties. 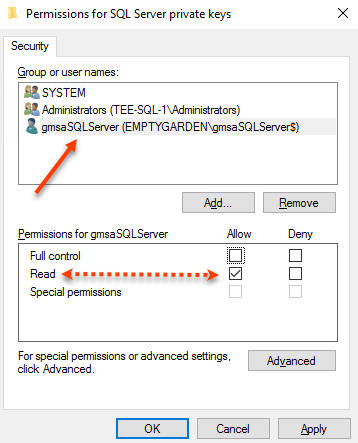 Add the account that is running the SQL services and provide it read permissions. 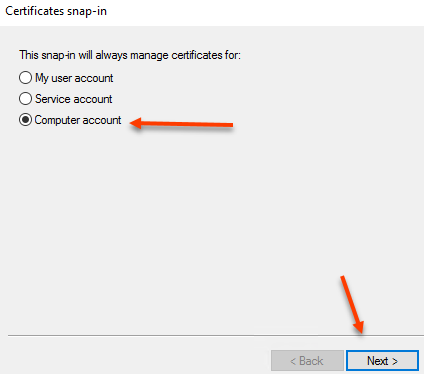 You have now enrolled the SQL Server certificate and given the SQL Server service account rights to read it. That last section had a lot of steps. There must be an easier way! 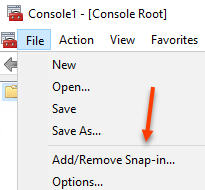 The following PowerShell script will do the same as above. 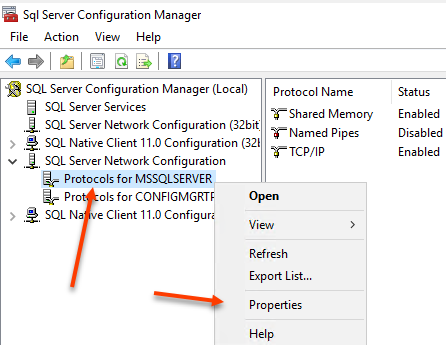 Open SQL Server Configuration Manager and select SQL Server Network Configuration > Protocols for MSSQLServer. Select OK. You will be prompted to restart the SQL services. 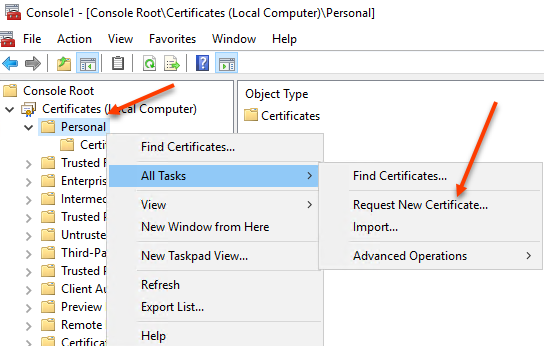 The services need to be restarted for SQL Server to bind to the cert. 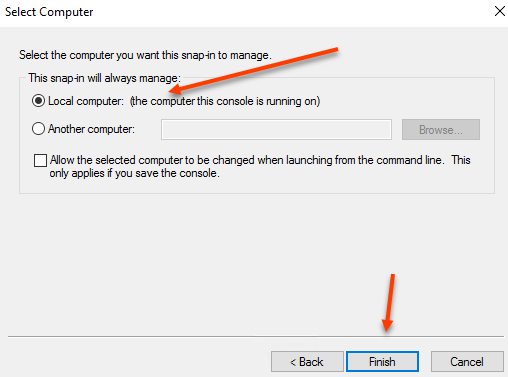 Previous PostPrevious PowerShell Template–Because we all want some sort of consistency!